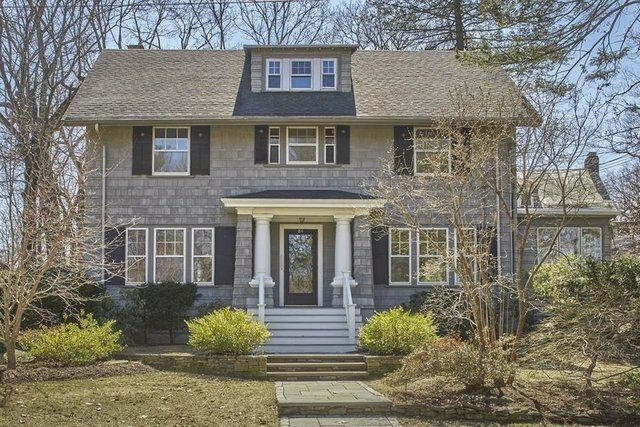 This classic center entrance Colonial style home built in 1920 is beautifully sited on a 14,500 SF lot in Newton's coveted Mason Rice neighborhood. This stunning home exudes a warm and comfortable feeling throughout and is part of a vibrant community with a short walk to the elementary school, Whole Foods, and all that Newton has to offer. The beautiful foyer with handsome staircase opens to the elegant dining room with original built-ins as well as the front to back living room with wood burning fireplace perfect for entertaining on any scale. The sun-filled family room with walls of windows offers tranquil views of the beautifully landscaped grounds. A charming eat in kitchen sits at the rear of the home with direct exterior access to the expansive deck. The 2nd floor features 3 large bedrooms, a study, and spacious bath. The 3rd floor includes an additional bedroom, loft, and full bath.